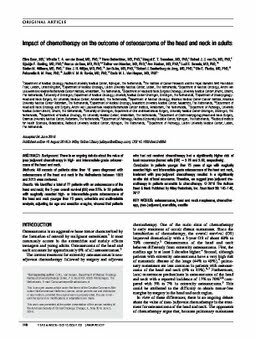 Background: There is an ongoing debate about the value of (neo-)adjuvant chemotherapy in high- and intermediate-grade osteosarcoma of the head and neck. Methods: All records of patients older than 16 years diagnosed with osteosarcoma of the head and neck in the Netherlands between 1993 and 2013 were reviewed. Results: We identified a total of 77 patients with an osteosarcoma of the head and neck; the 5-year overall survival (OS) was 55%. In 50 patients with surgically resected high- or intermediate-grade osteosarcoma of the head and neck younger than 75 years, univariate and multivariable analysis, adjusting for age and resection margins, showed that patients who had not received chemotherapy had a significantly higher risk of local recurrence (hazard ratio [HR] = 3.78 and 3.66, respectively). Conclusion: In patients younger than 75 years of age with surgically resected high- and intermediate-grade osteosarcoma of the head and neck, treatment with (neo-)adjuvant chemotherapy resulted in a significantly smaller risk of local recurrence. Therefore, we suggest (neo-)adjuvant chemotherapy in patients amenable to chemotherapy.